How quickly could you spot a serial killer? Male? Female? Young? Old? In fact, most of us know that anyone of us could be a killer. There are obviously recurring themes when you research the lives of these killers; dreadful childhoods, lack of love and support, lack of feelings etc etc... but very few people think of these things when they bump into a stranger on the street or park beside them at the supermarket. Who is standing in line alongside you at the library? How often have you seen the same person at the bus stop beside your local coffee shop? Can you continue to believe that there is inherent goodness within us all, or should you start to doubt everyone you encounter? There are no answers to these questions, by the way, but this is a book that will make you think about who you can trust and how much should you believe to be true. I almost inhaled this book in one sitting. It is clever, sassy, different and inspiring. A brave new voice in the world of thrillers. A voice that demands to be heard, and remembered. Bravo Graeme Cameron. 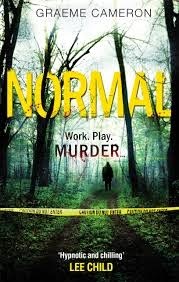 Who wants 'Normal', in fiction, all the time??? A massive thumbs up from Bleach House Library! Thanks for bringing this to my attention. I think I may have heard something about it but this is the first review I've spotted. It sounds intriguingly different to the 'normal' serial killer story, so one for the 'library wish list'. I think I will love this, I'm definitely going to get myself a copy!